The temple is w. . . I knew that this was a burning crisis for this young girl, and it needed immediate attention, or else it could create lasting damage in her life. I told her, “I can give you many reasons. I shall also tell your parents not to pressurise you. Our temples are places of rejuvenation, more than places of worship. Our ancient masters have repeatedly told us that what we seek is within us; we are like musk deers who go on searching for the musky fragrance without knowing that it is coming from their own bodies.” “Then, why were temples created? Why do we have so many deities?” She asked. I saw that she was getting the gist. Each idol, present in a temple, represents a dimension of our own life. We need to be reminded of these different dimensions, which, in turn, need to be rejuvenated within us. The major dimensions are peace, power, auspiciousness, strength, willpower, power of knowledge, and power of action. Hence, we have deities representing them in temples. When we stand in front of the deity, decorated and illumined, our eyes get rejuvenated. When we hear the mantras, chants, and bhajans, our ears get rejuvenated. When we smell the fragrance of flowers, incense sticks, camphor and sandalwood, our nose gets rejuvenated. When we apply sandalwood paste, sacred ash, or vermillion on our body, our skin gets rejuvenated. As we mostly apply it to our third eye (space just above and between the eyebrows), the 72000 nadis or conduits that circulate pranic energy into our system get rejuvenated. When we consume sacred water and other offerings from the temple, our tongue gets rejuvenated. When our senses get rejuvenated, our mind too, in turn, gets rejuvenated. Mantras energise and calm the mind, resulting in positive actions. When we offer fruits, flowers, or money to the deity, it signifies sacrifice and surrender. Surrender means a state of no ego. When ego, which is the wall between man and God, dissolves, we become one with Him. This is the reason why people prostrate before deities in temples. Finally, all the deities of every temple are infused with energy or programmed to transmit positive energy to devotees. So, when we approach the deity, an energy transfer happens in about 40 seconds; this is what we consider as blessings. If we consider the idol merely as stone, we are mistaken. Every atom represents the Creator, and man has learned to use this knowledge to rejuvenate and strengthen himself so that he can lead a good life. Hence, temples help us tremendously. And what is the highest prayer? “Thank You.” It represents contentment and gratitude. There is nothing more to say to the all-knowing God. 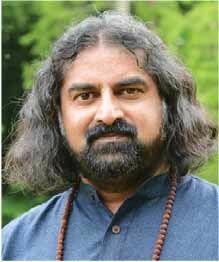 Founder of Ammucare charitable trust, Brahmarishi Mohanji is a contemporary spiritual master who delivers the most profound truths with laser-sharp clarity, simplicity and humour.